Why build an app to clean sidewalks ? When I moved to San Francisco, in May of 2017, it didn’t take long to realize that the city was facing an all out health crisis. Take a quick walk through most neighborhoods and you’ll notice the human and animal waste, needles, trash, and other unsanitary objects that litter the streets and sidewalks. 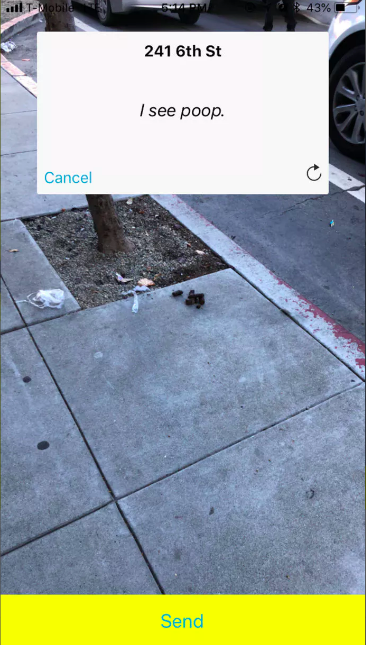 In fact, one resident had already created a San Francisco Poop Map to illustrate the problem. Since I was living in one of the worst neighborhoods in the city, I immediately became accustomed to seeing these things on my commute to and from work each day. My friends and housemates were constantly talking about the filth and brainstorming ways that it could be fixed. We sort of became obsessed with the problem. That’s when we came up with the idea for a camera app that would allow citizens to report what they saw to the city. San Francisco has an app for this called SF311. The problem with this app is that it just takes far too long for a user to submit a ticket. The app is complicated and it can take over a minute to take the photo and actually send it in. After realizing the workflow could probably be reduced to just two clicks, the idea for Snapcrap was born. Unfortunately, we were all too busy with our day jobs and side projects to actually build the app. I’m still seeing human waste on the streets every single day and it seems that the problem is only getting worse. I tried using the 311 app occasionally, but out of frustration for how annoying the experience was I always gave up before getting to part where I’d press send and hope for the best. I finally had enough and decided it was time to make Snapcrap a reality. 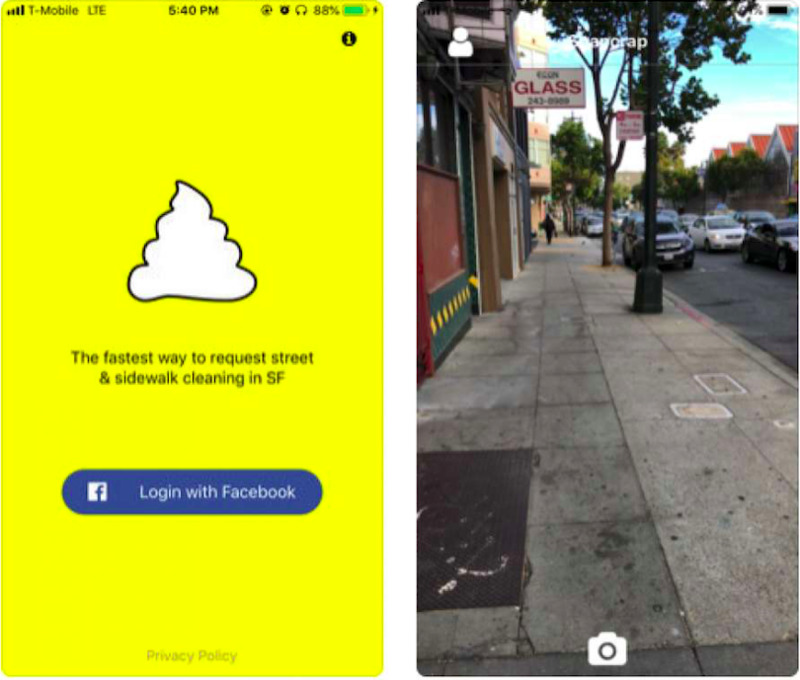 SnapCrap is a mobile app that allows residents of San Francisco to request street and sidewalk cleaning from the city’s Public Works department. In just two clicks, a user can snap a photo, send it to our system and have the ticket delivered to the city. Users can then track their tickets through the app. “See something gross? Just snap a photo and press submit” is how the description reads in App Store. I got to work on the app and released v1 in early October. The response was incredible. The app was downloaded over 7,000 times in less than two weeks. The media noticed it and Snapcrap ended up being written about world wide. Some of the notable publications that covered the story were The LA Times, Vice, Fox News, and NY Post. The initial success of the app was really exciting, but there was one big problem. The only way into the app was to sign in with a Facebook account. Many people didn’t understand why they had to link their social media to get in. To make matters worse, Facebook had a massive data breach literally days after Snapcrap went live on the app store. It was then that I started receiving dozens of emails from people who were wanted to use the app but refused to use their FB account. On top of that, there were tons of people who literally didn’t have a FB account. As a result, the overwhelming majority of my app store reviews were complaints about Facebook. I knew I needed to provide an alternative option as fast as possible. After evaluating the possible alternative login options, I decided that a one-time SMS verification code made the most sense. I clearly wasn’t going to use another social media platform, and creating an entire account would have been over-engineering it. SMS seemed to be the most popular and ubiquitous way of verifying unique users. Here’s where PHLO from Plivo came in. The first thing I did was to build the business logic using the drag & drop components within the PHLO canvas. Within a couple of minutes, I had a well designed and tested SMS verification process that was ready. Integrating it within my App was very easy thanks to the simplified integration & deployment workflow within PHLO. The response from this change was incredible. Almost 2,000 people opted to verify their phone number via SMS verification in the first week and almost every person who chose this option ended up being successfully verified. Everyone has a mobile number, and SMS is mostly free/cheap, so it’s definitely the lowest common denominator for verifying your users. It also provides an awesome way to communicate with users that have opted-in to receive SMS updates and alerts. PHLO was extremely easy to use and it allowed me to build the feature in my app and then simply integrate it into an entirely new workflow, from beginning to end in a night after my day job.